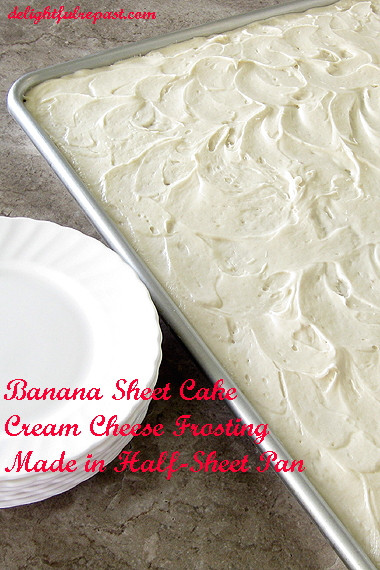 Banana Sheet Cake is the perfect cake to make for a picnic, potluck or any kind of feed-a-crowd occasion. Especially during summer, when you really want to get out of the kitchen as soon as possible. In hot weather, bananas can go from just right to rotten overnight. So when you need to use up those perfectly freckled, overripe bananas, this recipe will get you in and out of the kitchen quickly. No messing about with layers. No need to get out the piping bag. Just bake it in a half-sheet pan and serve it right from the pan. Of course you can cut it into three or four equal pieces and make a fancy layered creation, but not this time. Bake it in the pan. Frost it in the pan. Carry your pan to a picnic or potluck. Serve it from the pan. No muss, no fuss. It's summer, people, and I'm keeping it easy but real. Don't try to make this in a smaller pan, like a 15x10 jelly roll or a 17x11; it would surely overflow and make a total wreck of your oven. Believe me, I'm not in the mood for that! If you don't have a couple of good half-sheet pans (and quarter-sheet pans), it's time to get some. They are true kitchen workhorses, and I'd hate to be without them. A half-sheet pan with a plastic lid makes taking it on the road super easy. If you're not a banana fan, you might want to try my Meyer Lemon Sheet Cake or Chocolate Buttermilk Sheet Cake. For afternoon tea, cut the cake into 1.25- to 1.5-inch squares to stand in for petits fours. If you like nuts, finely diced walnuts or pecans (toasted, of course) can either be added to the cake batter or sprinkled on top of the frosting. What do you think - nuts or no nuts? 1 Preheat oven to 350F/180C/Gas4. Grease, butter or spray an 18x13x1-inch half-sheet pan. In small bowl, whisk together flour, baking soda, baking powder and salt. Note: If you want to remove it from the pan, line the bottom of the pan with parchment paper, overhanging a bit on the ends, and spray the paper as well. 2 In medium bowl, mash bananas and 1 tablespoon lemon juice with large fork or potato masher. 3 In measuring cup, put vinegar or lemon juice, add milk to make 1 1/3 cups; stir gently and let stand for 5 minutes. 4 In large bowl, cream butter and sugar together until light and fluffy. Beat in eggs, one at a time, then vanilla and mashed bananas. Add dry ingredients and soured milk alternately to wet ingredients, and stir just until combined. Scrape into prepared pan; smooth top. 5 Bake for about 25 to 30 minutes, or until toothpick inserted in center comes out clean. Cool for an hour in pan on wire rack before frosting. Get out the butter and cream cheese to be softening during that hour. Note: If you are removing it from the pan, let it cool in pan on wire rack for ten minutes before turning it out onto wire rack and removing the parchment. 6 In bowl of stand mixer or a 2.5-quart bowl and hand mixer, cream together cream cheese and butter. Add powdered sugar, in three batches, beating well after each addition. Add vanilla extract and enough milk to make the frosting a good spreading consistency. We're not piping this frosting, so the consistency isn't so crucial; it just needs to be easily spreadable. Use an offset spatula to spread the frosting. I have some walnuts that would go very nicely in this - yummy! Thanks, I do love it with walnuts, Mrs Shoes! Somewhere in this vast world is a person who likes banana sheet cake but hates the frosting. I need to find that person. Do lunch together. Added extraneous information: when I was about four years old, my mother made the mistake of putting a banana cream cake on top of the fridge in anticipation of my sister’s birthday the next day. Sometime in the early a.m. I arose to a sleeping house and, venturing to the kitchen and somehow scaling the heights to the top of the fridge, took a swipe of frosting off the cake. One swipe led to another until – alas – the cake was bare. Horrible. Cuff me. I dream on…naked cakes everywhere. Thanks for the recipe,Jean!I like banana's cake,I usually make one with cinnamon that my sons love!Yours looks delicious.Hugs. Sully, you and I make the perfect dessert-eating team. I will happily scrape off all the frosting and just eat the cake. Even when I was four, I would have preferred that cake after you'd scaled the heights and left it bare! Thank you, Maristella. Cinnamon is good, too! Sounds delicious, Jean. I think I'd sub rice milk for the milk (can't do dairy) and make frosting without the cream cheese, but that'd work, right? Oh, yum, yum, yum. Thanks, friend. Karen, thanks! And there's no reason the non-dairy wouldn't work just fine. I've used rice milk many times; I add the vinegar to it just as I would the regular milk. I can eat baked goods with bananas, Jean, but can't eat them raw! I know, I'm weird, but even the smell of them makes me gag, but not when they're baked! We humans are funny creatures, aren't we? Yes, I'd love a piece of your cake, but no raw bananas on top, please!! I'm more of a raw banana person than a cooked one but this looks really delicious for some reason! Especially with cream cheese frosting! Jeanie, thank you. One thing about it is that with so little sugar in the cake, the true banana flavor comes through loud and clear. This looks delicious and perfect for a picnic! Thanks for sharing. Thank you, Bernideen. And I have several glass dishes, each with four pieces of cake, in the freezer - ready for tea and cake on days too hot to bake! Yum and a great size for a gathering! Thank you, Ellen. Yes, great size and easy to transport! I'm a little wary of bananas in cooking but I do enjoy a basic banana bread. I love your tips for keeping this simple... and I'm off to look at the lemon version now, too. This dessert is very appealing to this banana lover! Pauline, if you enjoy banana bread, you should like this cake. 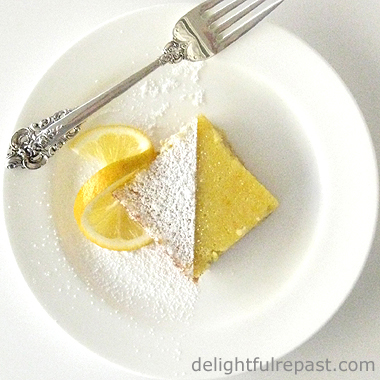 But the lemon sheet cake is definitely one of our favorites. Thanks, Margie. Aren't bananas wonderful! This is the perfect recipe! I always have soft bananas and I love that it serves a crowd and is easy to make. Thanks Jean! Karen, thank you so much! I hope you'll enjoy it as much as we do. That looks seriously tempting with cream cheese frosting! I need to expand my recipes uses bananas. This is a beautiful cake and I have to try it. Thank you for the recipe. Looks delicious. And what great way to use bananas! Thanks, Angie. And the amount of frosting is exactly what's needed for the cake, so no leftover frosting to go to waste. Gerlinde, thanks. I hope you'll try it soon and let me know how you liked it. Dawn, my husband might have written your comment! :D And yet he loves this cake. Go figure. Thank you, Cathy. I'm always trying to improve in my efforts to stop kitchen waste. This cake will be delicious and I can't wait to try it. Hope you have a fantastic weekend and thanks so much for sharing your awesome post with us here at Full Plate Thursday. We hope to see you again real soon. I love sheet pan cakes!n I agree they are so much easier and great for serving a crowd! Miz Helen, thank you! I served it on a hot evening with iced tea, and it was a good combination. Thank you, Patrick! Yes, you'd have to make a couple of layer cakes to serve as many people as this. 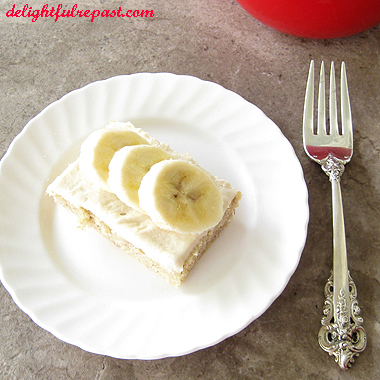 This looks so yummy and a great way to use up bananas! Thanks for sharing greatly appreciated! But I just learned how to use a piping bag! :) Love this cake recipe. Pinning. Thanks, Lea Ann. Too funny! I used to do such fancy cakes, long before I started blogging. Now I wonder, Who *was* that woman?! Whitney, thank you. I love that this big cake takes so little sugar. This reminds me so much of family picnics in Vermont when I was a boy. Am sharing it with my colleague Lisa, as she is making "everything banana" these days! Ohhh, David, a family picnic in Vermont sounds wonderful, especially one in autumn! Thanks for sharing this with your colleague. I hope she likes it. I read with amusement Thomas Sullivan's comment (above) about the person who ate all of the cream cheese icing off of his mom's banana cake. I believe that person must have been me- his search is now over- I love cream cheese icing! Fran, you and I would get along well, too! Though I like a tiny bite of good frosting, I'm happy to scrape it off and give it to a true frosting fan. I've always liked just plain unfrosted cake. Sweetie, it is so dangerous to come visit you. I watch what I eat, lost 20 pounds in the last year, and every post on your blog makes me hungry. Now I want banana cake with cream cheese icing. Sounds so tasty. Aw, Carol, thank you so much! And congratulations - good job! Just do what I do - cut the cake into 32 pieces and scrape the frosting off yours, which leaves you with a nice size piece of cake that has only 1.5 teaspoons of sugar! The frosting would add another 2.5 teaspoons to the slice, which is still within my daily sugar allowance of 6 teaspoons. I have a potluck on Wednesday and I think these would be perfect! Thanks for sharing on the #Celebrate365 Blog Party. Val, that is so cool! Thank *you*! Thanks, Kerry! Let me know how it turns out for you! I like this no fuss no muss recipe and I have some bananas in the freezer ready and waiting. Sheet pans are SO useful, aren't they? Can imagine a kitchen without two or three. Anyway, super dessert -- love the frosting. Thanks! Thanks, John. Yes, I need to get one more half-sheet and one more quarter-sheet, then I'll feel like I have enough! I make a very similar cake Jean and it's one of my families favorites. Yours looks delicious as well! Thanks for sharing the recipe with SYC. Thank you, Jann. I love that the sweetness of the bananas means I can cut back on the sugar without anyone noticing! I love anything banana!! Thanks for sharing at the What's for Dinner link up! Thanks, TLG. Me, too! I especially like just a plain banana. Hi Jean, love the idea of popping the fresh banana on top - thanks! Thank you, Carole! I love bananas in or on everything or just by themselves! Dawn, thank you so much. But hurry up now before those bananas go completely off! Thank you so much, Miz Helen! You put together some lovely meals with your picks every week. Your Banana Sheet Cake looks delicious, Jean. It's just the kind of cake I love for easy entertaining any time of day! I'll be sharing this round. Thank you so much for sharing, and for being a part of Hearth and Soul. Hope to 'see' you again this week! April, thank you! And thank you for sharing it around. It's such a favorite of ours, and it goes so well with tea!